The Volusia Flagler Association for Women Lawyers sponsored the "Bowling for School Supplies" fund-raising event on Friday, June 18, 2010 at Ormond Lanes. Along with the entrance fee, participants donated new school supplies for the students of Holly Hill Middle School. The event featured two hours of bowling, shoes, food, prizes and fun, fun, fun. 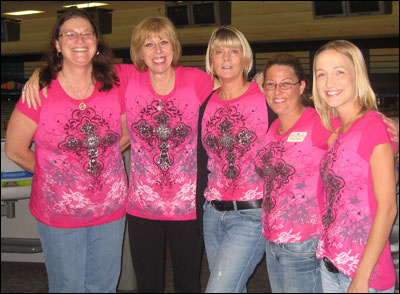 Pictured above left to right are Beth Robins, Kenley Matejka, Patti Humphreys, Tracee Burns and Sara Merryday.